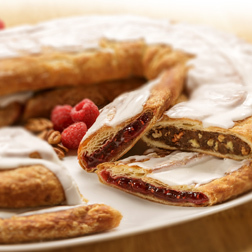 This AWARD WINNING KRINGLE is chocolaty rich and sure to be a favorite! 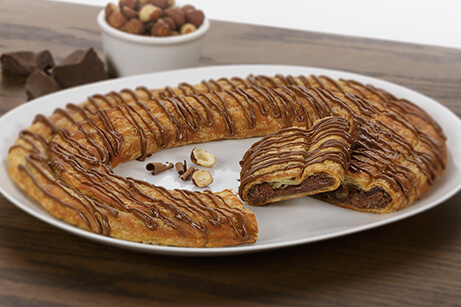 Our Chocolate Hazelnut Kringle has luscious Nutella filling that goes together perfectly with our traditional flaky pastry. It’s topped off with a dark chocolate drizzle. 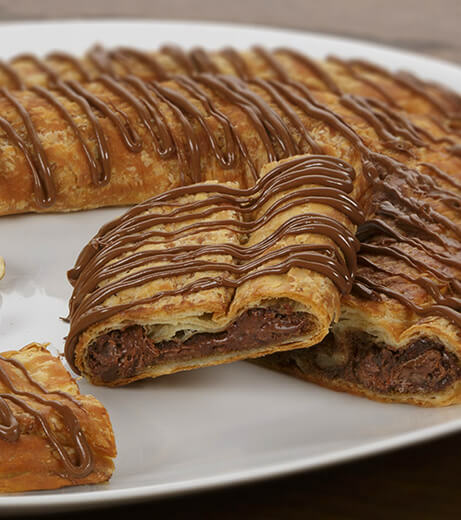 It’s truly decadent! Contains egg, milk, soy, wheat and hazelnut. May contain traces of tree nuts (almonds, macadamia nuts, walnuts, pecans, coconut) and peanuts. Sugar, Wheat Flour, Margarine (Interesterified Soybean Oil, Water, Salt, Mono- and Diglycerides, Colored with Annatto/Turmeric. Calcium Disodium EDTA added as a preservative. Artificial Butter Flavor. Vitamin A Palmitate added. ), Palm Oil, Brown Sugar (Sugar, Cane Syrups), Hazelnuts, Skim Milk Powder, Dutch Cocoa 2% or Less of the Following: Eggs, Corn Syrup, Guar Gum, Soy Flour, Canola Oil, Yeast, Soy Protein, Soy Lecithin, Dextrose, Calcium Carbonate, Natural & Artificial Flavors, Whey Powder (Milk), Maltodextrin, Agar-Agar, Calcium Propionate Preservative, Tocopherols Preservative, Malted Barley Flour, Cinnamon, Corn Starch, Chocolate Liquor, Color Added.